Newspapers bind their every issue in big green archive books. Ours have been patiently waiting in the upstairs ghost town of our offices until a couple of weeks ago, when they were hauled into the light and scoured. The research for our 20th Anniversary Issue took us way too long because we kept stopping to read nearly every article. 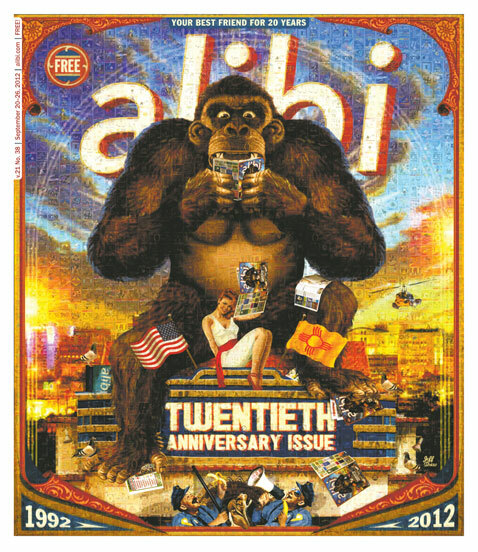 On stands this week is a collector’s edition of the paper, a look back at two decades of the Alibi (née NuCity) and its best friend: Burque. I like the heft of the corporeal version, but you can, of course, dig through it digitally.